The other day when I was picking Birdy up from the KITA (i.e. the kindergarten) one of her group’s teachers used the relative quiet in the room for a one-on-one conversation. He asked me how much German Birdy hears on a day to day basis as the teachers were concerned that she doesn’t understand them. Apparently our little one completely ignores such simple requests as following to the other room to change her diaper or gives blank look when asked whether she wants something to drink. While one part of my brain made a sarcastic comment along the lines of “well, that was bound to happen sooner or later” the other part had no trouble empathizing with the teachers. Birdy has been slow to start talking (I suppose that’s the price for walking at 10 months – one cannot do it all at once!). She started slowly expanding her vocabulary around the age of 16-17 months and most of the words that she currently uses are based on Latvian. So, even if she talked a lot in the KITA (which she doesn’t) nobody would understand much anyway. Latvian also continues to be the language that she understands the best. This is reinforced by the fact that also hubby – her main German input – uses Latvian words, e.g., to warn that she should be careful or that something is hot, because he knows that she understands it better. While her German skills will not be a problem in the long run, I can see how it might be inconvenient for her kindergarten teachers at the moment. Yet, I can’t help wondering whether Birdy really doesn’t understand what the teachers want from her or does she simply choose to ignore it. It would be so easy to blame her failure to comply on a lack of language skills. Our little one has a mind of her own and, although I’m pretty certain that she usually understands what I want her to do, it doesn’t mean that she will do it. She is a toddler, after all. Be that as it may, in the upcoming months we will be paying a little more attention to Birdy’s German input at home. It cannot hurt, right? We’ve also had a conversation with the kindergarten teachers on language. English is a second language for Lauris, but I’m not worried about it at all. Once I saw the teacher was concerned I asked Lauris, and he replied that he was having trouble understanding the teacher – she speaks with a heavy Southern, African American accent. So have you asked Birdy? Maybe it’s something else? Hi there! Just stumbling upon your blog and was wondering when Birdy started going to nursery and if there had been any improvement. My son understood German (dad is English and I’m French) before going so we didn’t have any trouble but in our Krippe there was a 2,5 year old Bulgarian girl who had a longer adaptation phase before understanding and speaking but our nursery staff didn’t make a big deal out of it and now one year later, all is good. Thank you for your comment and welcome to the blog! Do I understand correctly that your son is attending a German only KITA? Birdy started as she was one and, although her dad speaks German to her, at that point her comprehension of Latvian was better. 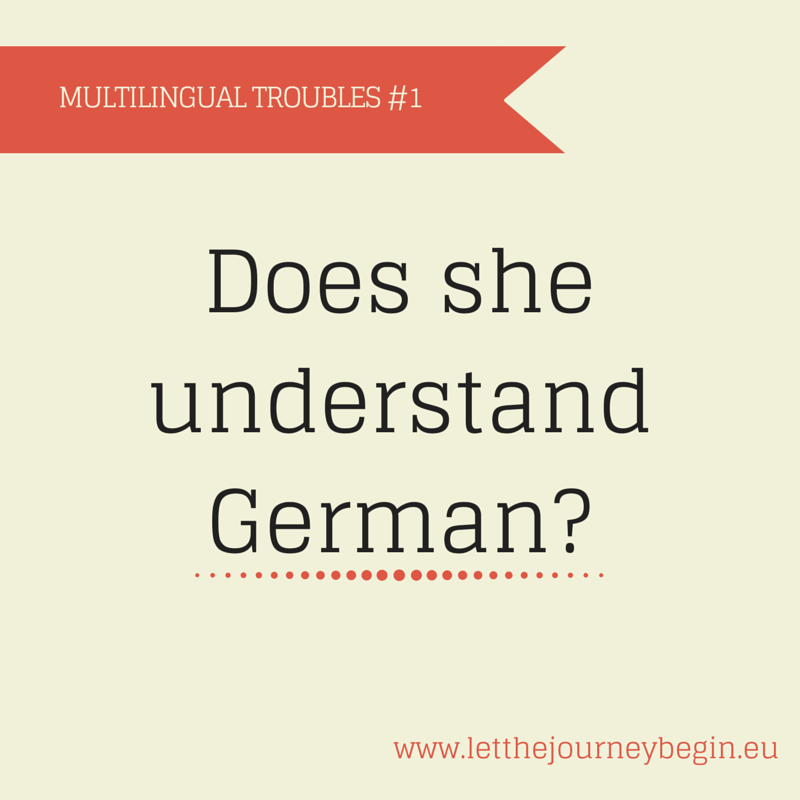 She improved quite quickly though and now at 1,5 years she understands both equally well and is picking up German words quickly.